Yesterday was a family picnic event at Buddy’s school where parents bring lunch to school and do activities with the kids. You may remember that I did this before with Baby Girl. Now it’s little brother’s turn! 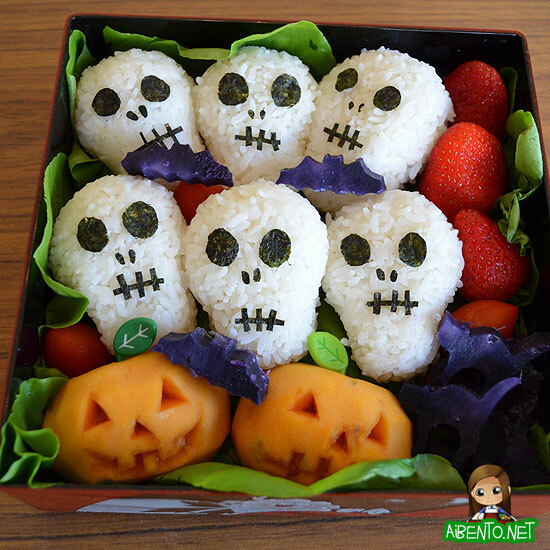 Ever since he saw my photo in the Star Advertiser last week, he’s been telling me (not sure why me) that I’m “famous with bentos” and he’s been telling me which bento from Yum-Yum Bento Box he wants for lunch. He requested Maki’s chick tamagoyaki the other day and for Friday, he requested my Miss Octopus. I told him I’d come up with something else. 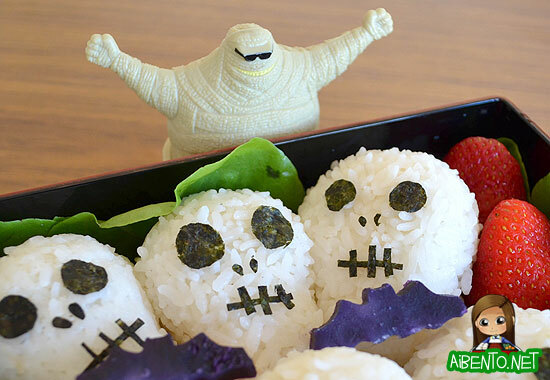 Since it fell so close to Halloween, I decided to make it a spooky themed lunch, figuring he’d get a real kick out of it. Here’s the first layer, which holds skeleton musubis, bat and black cat sweet potato, jack-o-lantern persimmons, and strawberries. He saw one of the skeletons before he left for school, but he totally freaked over the bats and cats when we opened it up at school. So much that he ate them all without asking us if we wanted any. LOL! 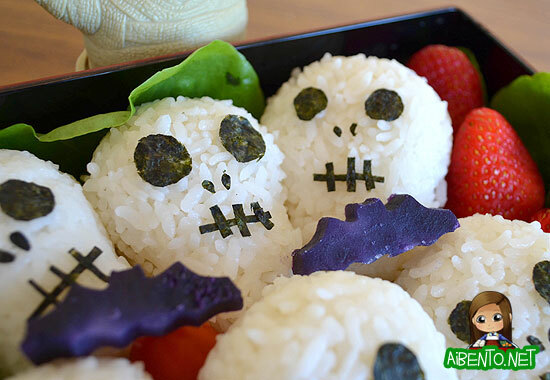 Here’s a close-up of the skull musubis. I just cut the nori out with my scissors, no need for a punch. I used saran wrap to shape the skulls. The bottom row. I found that with all the bright colors, it really helped give it a Halloween-y look. 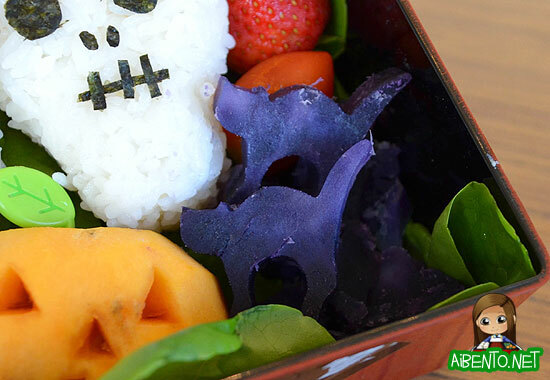 The skulls by themselves were cool, but add in the purple potato and the orange persimmon and suddenly the whole thing screamed Halloween. It was pretty cool to see such a transition! Here’s a closer look at the jacks, which you can see a video tutorial on here. Persimmons just started showing up in the markets again last week, which makes me soooo happy. Here’s a closer look at the cats. To cut this and the bats, I used these cutters: Fox Run Mini Halloween Cookie Cutter Set . Unfortunately, looks like it’s out of stock, but maybe you could find it locally or pick another set like this Wilton one. 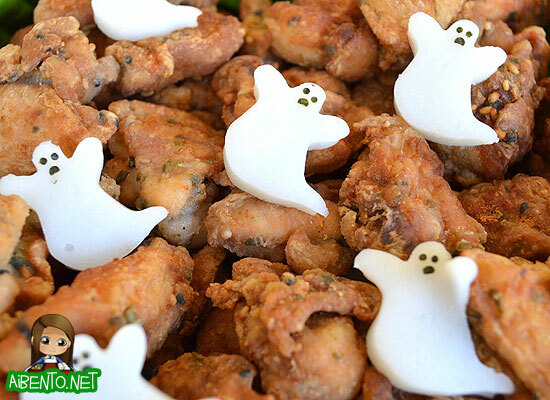 Next up, haunted chicken! 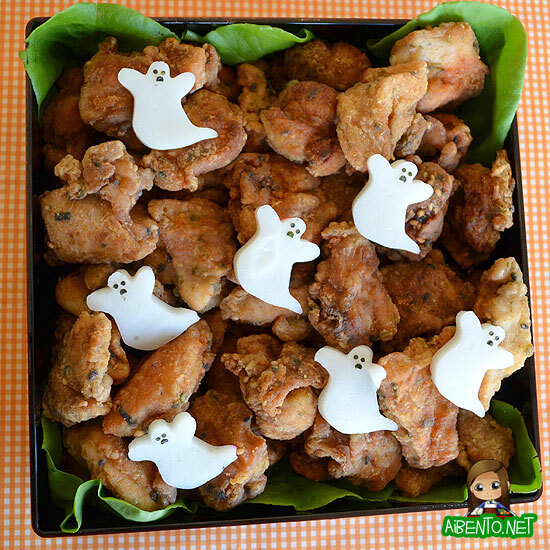 Included in the set was a ghost, so I used that one to cut out kamaboko ghosts to lay on top of the fried chicken (which I cooked so much of that we were able to eat it for dinner). I used one of my mini Carla Craft punches for the ghost face. More specifically, I used the bear. 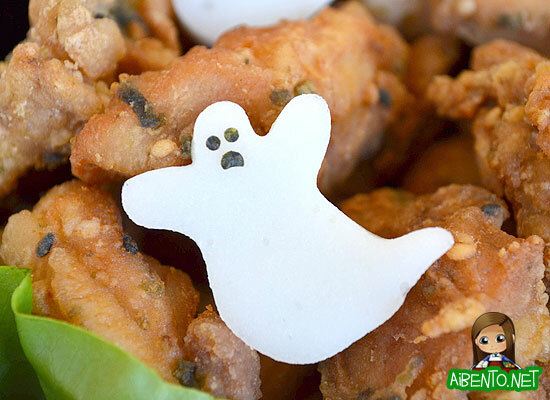 The ghost mouth is a bear ear! And one last close-up photo. I also packed watermelon, grapes, and peach Jello in another layer that I didn’t photograph because it was just tossed in for him cause he loves fruits. Baby Girl only got to see one skull before leaving for school, so after school I tell Buddy to tell her what was in it. And that was the end of his story. LOL! 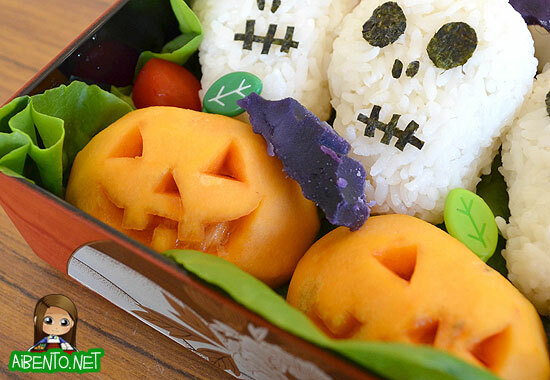 Note to self, if I want any bento to be a success, just add Jello. 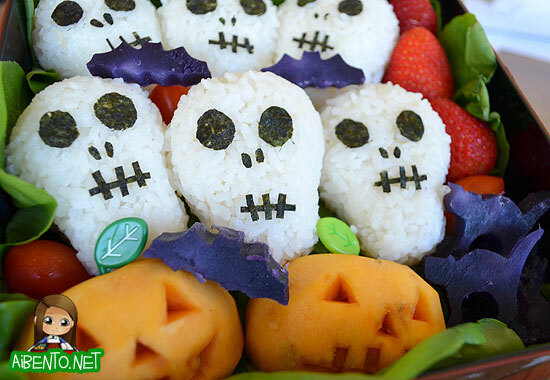 I’ll post a skull musubi tutorial soon!